1. Durable powder coat paint. 2. Double pawls with springs provide redundancy for reliable operation of brake mechanism according to CE-regulations. 3. Load chain sprocket made of alloy steel with precision. 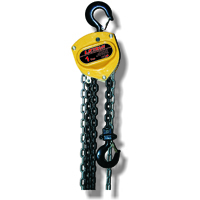 1. safety device could be used as an overload protection.it could not only run smoothly if the load is added,but also prevent the body pneumatic manual chain hoist block from damaging. 2. the chain guide fixed in one end ,which could avoid chain twisting. 3. hand chain link could avoid hand chain overturning.